Our group investigates the molecular and cellular mechanisms underlying cell-fate establishment and maintenance, cell motility, directed cell migration and early stages of organogenesis in the context of the live vertebrate embryo. The cells we are using as a model for studying these processes are germ cells, the founder cells of all sexually reproducing organisms. In many species, those cells actively migrate from the position where they are specified to the site where the gonad develops, where they interact with other cell types and eventually differentiate into sperm and egg. Germ cells thus serve as an excellent model for studying medically relevant issues regarding the molecular mechanisms controlling cell fate decisions (related to oncogenic transformation), invasive cell migration (related to tumour cell metastasis and inflammation) and organogenesis (related to organ function in health and disease). Our primary model organism is zebrafish, where studying these processes from the earliest stages of development is facilitated by the extra-uterine development of the translucent embryo. A developing zebrafish embryo (nuclei labeled in red) with germ cells (blue) migrating towards the sites where the gonad develops. Our group identified proteins whose function is essential for cell fate maintenance and cell behavior. An example for such a protein is Dead end, a vertebrate-specific protein whose functions is associated with an increased rate of testicular tumours. We study the role of those proteins using genetic, optogenetic and genomic techniques, making use of different microscopy modalities in live zebrafish embryos. Following the sub cellular localization of proteins and RNA molecules involved in germ-cell fate maintenance in live cells provides important hints concerning their mode of action of those molecules in fate specification. Exploring the mechanisms contributing for motility and directed cell migration, we defined the migration mode and molecules contributing for it. For example, we found that the germ cells form protrusions termed “blebs” for their translocation. This protrusion type is observed in various metastatic cancer cells as they spread and form secondary tumours. Following the acquisition of motility, the germ cells polarize and migrate directionally towards domains in the embryo where the guidance cue Cxcl12 is expressed. The precise positioning of organ progenitor cells constitutes an essential, yet poorly understood step during organogenesis. We use the germ cells and early gonad formation as a model for this important process. 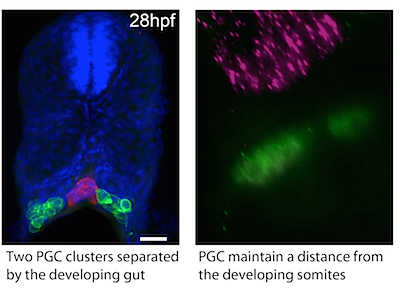 By the end of the first day of development, the PGCs reach their target and have to interact with somatic cells participating in gonad formation. Using live-cell imaging we found that the germ cells maintain their motility following their arrival at the gonad, yet remain in the region where the gonad develops. In addition to understanding the process of proper organ formation, determining the mechanisms confining motile cells to a specific site is highly relevant for understanding the process of cancer cell metastasis. Analysis of cell behavior, analysis of the process in manipulated embryos and mathematical modeling revealed a role for tissues neighboring the gut in maintaining the bilateral arrangement of the cell clusters, cell cluster size and positioning.